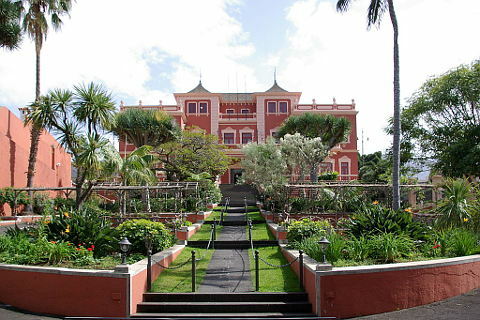 In the past many of the wealthiest residents of Tenerife lived in La Orotava and their influence can be seen in the many beautiful buildings. A particular feature are the beautifully carved wooden balconies and interior courtyards. 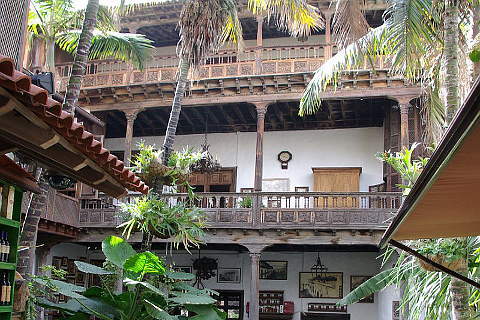 The Casa de los Balcones and the Casa del Turista both have lovely interior courtyards that are open to the public. 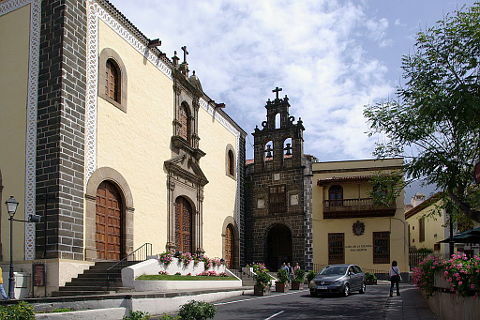 The Casa Mendez-Fonseca is another great courtyard and is home to a small museum and wine-tasting. Grapes are another of the main crops in the surrounding hills and so the wine is made locally. Casa Lercaro is a 16th century house in very typical Canarian style and as it has been converted into a restaurant and shop you can visit and see the lovely carved wooden balconies. The old town of La Orotava has been declared a Site of National Historic and Artistic Interest and there are lots of Renaissance mansions to admire as well as some beautiful churches and convents. Head for the Iglesia de Nuestra Senora de la Concepcion in the old part of the town. This church is a baroque church with a dome and two towers and was built in the 18th century. Other religious buildings to look out for are the Calvario chapel, the San Augustin church and the San Benito Abad monastery. A rather lovely building is the pink palace-like building of Liceo de Taoro which is an 18th century building surrounded by pretty gardens. It sits on a hillside overlooking the valley. The Liceo de Taoro is now a bar and so you can sit and enjoy the views whilst having a drink. Garden lovers can admire the formal Victoria gardens, also called the Jardines del Marquesado de la Quinta Roja, whose terraces sweep downhill from a mausoleum at the top. Another lovely garden is the Hijuela del Botanico, a tropical Botanic gardens with more than 3000 species of tropical and sub-tropical plants including the iconic dragon trees which are native to the Canary islands. Fiesta time is in June for the Feast of Corpus Christi when the town is full of flowers and giant pictures made of sand from Park Teide is made on the floor by the town hall. For great views of La Orotava and Mount Teide go to the Mirador de Humbolt viewpoint, you won't be disappointed! Puerto de la Cruz with its pretty harbour and excellent lido which was designed by Cesar Manrique is very nice. Families will be sure to want to visit Loro Parque with its excellent zoo and dolphin and killer whale shows. A visit to Teide National Park is a highlight of a visit to Tenerife. You can hike up to the top of Tenerife's volcano, Mount Teide, or take the cable car and enjoy the stunning views. You can find more local travel ideas in the Tenerife guide. Puerto de la Cruz is a lovely town with a pretty harbour and surrounded by lush tropical plants. Loro Park is one of Europe's best zoos and also has killer whale and dolphin shows. Enter the 18 meter long shark tunnel. Candelaria is an important pilgrim destination. Many visitors come to see the shrine of the Black Madonna. A stunning volcanic park with an active volcano, Mount Teide. Teide Park is in the centre of Tenerife and is a highlight of any visit. Icod de los Vinos is home to the oldest dragon tree on the Canary Islands. It has some pretty squares and is close to the Cueva del Viento larva tunnels. A beautiful little town on the north coast of Tenerife. Garachico has a very pretty centre and a harbour area full of natural rock pools. The capital of Tenerife and a destination for cruise ships touring the Canary Islands.